"American Media" redirects here. For the publishing company, see American Media (publisher). Media of the United States consist of several different types of media: television, radio, cinema, newspapers, magazines, and Internet-based Web sites. The U.S. also has a strong music industry. Many of the media are controlled by large for-profit corporations who reap revenue from advertising, subscriptions, and sale of copyrighted material. American media conglomerates tend to be leading global players, generating large revenues as well as large opposition in many parts of the world. With the passage of the Telecommunications Act of 1996, further deregulation and convergence are under way, leading to mega-mergers, further concentration of media ownership, and the emergence of multinational media conglomerates. These mergers enable tighter control of information. Currently, five corporations control roughly 90% of the media. Critics allege that localism, local news and other content at the community level, media spending and coverage of news, and diversity of ownership and views have suffered as a result of these processes of media concentration. The organization Reporters Without Borders compiles and publishes an annual ranking of countries based upon the organization's assessment of their press freedom records. In 2013–14 United States was ranked 46th out of 180 countries, a drop of thirteen points from the preceding year. Newspapers have declined in their influence and penetration into American households over the years. The U.S. does not have a national paper. The New York Times, The Wall Street Journal, and USA Today are the most circulated newspapers in the United States and are sold in most U.S. cities. Although the Times' primary audience has always been the people of New York City, the New York Times has gradually become the dominant national "newspaper of record." 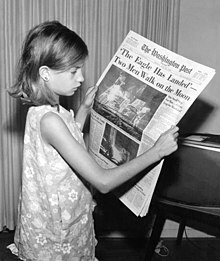 Apart from its daily nationwide distribution, the term means that back issues are archived on microfilm by every decent-sized public library in the nation, and the Times' articles are often cited by both historians and judges as evidence that a major historical event occurred on a certain date. The Los Angeles Times and the Wall Street Journal are also newspapers of record to a lesser extent. Although USA Today has tried to establish itself as a national paper, it has been widely derided by the academic world as the "McPaper" and is not subscribed to (let alone archived) by most libraries. Apart from the newspapers just mentioned, all major metropolitan areas have their own local newspapers. Typically, a metropolitan area will support at most one or two major newspapers, with many smaller publications targeted towards particular audiences. Although the cost of publishing has increased over the years, the price of newspapers has generally remained low, forcing newspapers to rely more on advertising revenue and on articles provided by a major news agency wire service, such as the Associated Press, Reuters or Bloomberg News for their national and world coverage. With very few exceptions, all the newspapers in the U.S. are privately owned, either by large chains such as Gannett or McClatchy, which own dozens or even hundreds of newspapers; by small chains that own a handful of papers; or in a situation that is increasingly rare, by individuals or families. Most general-purpose newspapers are either being printed one time a week, usually on Thursday or Friday, or are printed daily. Weekly newspapers tend to have much smaller circulation and are more prevalent in rural communities or small towns. Major cities often have "alternative weeklies" to complement the mainstream daily paper(s), for example, New York City's Village Voice or Los Angeles' L.A. Weekly, to name two of the best-known. Major cities may also support a local business journal, trade papers relating to local industries, and papers for local ethnic and social groups. Probably due to competition from other media, the number of daily newspapers in the U.S. has declined over the past half-century, according to Editor & Publisher, the trade journal of American newspapers. In particular, the number of evening newspapers has fallen by almost one-half since 1970, while the number of morning editions and Sunday editions has grown. The primary source of newspaper income is advertising – in the form of "classifieds" or inserted advertising circulars – rather than circulation income. However, since the late 1990s, this revenue source has been directly challenged by Web sites like eBay (for sales of secondhand items), Monster.com (jobs), and Craigslist (everything). Additionally, as investigative journalism declined at major daily newspapers in the 2000s, many reporters formed their own non-profit investigative newsrooms. Examples include ProPublica on the national level, Texas Tribune at the state level and Voice of OC at the local level. Thanks to the huge size of the English-speaking North American media market, the United States has a large magazine industry with hundreds of magazines serving almost every interest, as can be determined by glancing at any newsstand in any large American city. Most magazines are owned by one of the large media conglomerates or by one of their smaller regional brethren. The American Society of Magazine Editors sponsors the annual National Magazine Awards recognizing excellence. 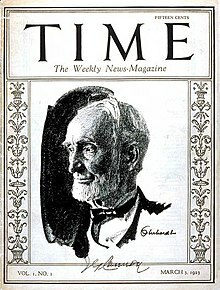 The U.S. has three leading weekly news magazines: Time, Newsweek and U.S. News and World Report. Time and Newsweek are center-left while U.S. News and World Report tends to be center-right. Time is well known for naming a "Person of the Year" each year, while U.S. News publishes annual ratings of American colleges and universities. The U.S. also has over a dozen major political magazines, including The Atlantic and The New Yorker among others. Finally, besides the hundreds of specialized magazines that serve the diverse interests and hobbies of the American people, there are also dozens of magazines published by professional organizations for their members, such as Communications of the ACM (for computer science specialists) and the ABA Journal (for lawyers). American radio broadcasts in two bands: FM and AM. Some stations are only talk radio – featuring interviews and discussions – while music radio stations broadcast one particular type of music: Top 40, hip-hop, country, etc. Radio broadcast companies have become increasingly consolidated in recent years. National Public Radio is the nation's primary public radio network, but most radio stations are commercial and profit-oriented. Talk radio as a political medium has also exploded in popularity during the 1990s, due to the 1987 repeal of the Fairness Doctrine, which meant that stations no longer had to "balance" their day by programming alternative points of view. The Federal Communications Commission (FCC) in 1970 had limited the number of radio station one person or company could own to 1 AM and 1 FM locally, and 7 AM and 7 FM stations nationally. But due to extensive concentration of media ownership stemming from the Telecommunications Act of 1996, radio companies could own not more than 8 local stations per area market. Most stations are now owned by major radio companies such as iHeartMedia (formerly Clear Channel Communications), Cumulus Media, Townsquare Media, and CBS Radio. See IBOC and HD Radio. A new form of radio that is gaining popularity is satellite radio. The two biggest subscriptions based radio services are Sirius Satellite Radio and XM Satellite Radio, which have recently merged to form Sirius XM Radio. Unlike terrestrial radio music channels are commercial free and other channels feature minimal commercials. Satellite radio also is not regulated by the FCC. During the advent of the internet in the 21st century, internet radio and digital streaming services have been emerged. Among popular brands are Pandora and iHeartRadio. Although, the recording industry also sees Internet radio as a threat and has attempted to impose high royalty rates for the use of recorded music to discourage independent stations from playing popular songs. Arbitron, a consumer research company, provides ratings (similar to the Nielsen ratings) for national and local radio stations in the United States. Ninety-nine percent of American households have at least one television and the majority of households have more than one. The four major broadcasters in the U.S. are the National Broadcasting Company (NBC), CBS (formerly the Columbia Broadcasting System), the American Broadcasting Company (ABC) and the Fox Broadcasting Company (Fox). The largest of these networks, Univision, launched in 1986 as a successor to the Spanish International Network. Its major competition is Telemundo (est. 1986), a sister network of NBC (which acquired Telemundo in 2001). Public television has a far smaller role than in most other countries. However, a number of states, including West Virginia, Maryland, Kentucky, and South Carolina, among others, do have state-owned public broadcasting authorities which operate and fund all public television stations in their respective states. The income received from the government is insufficient to cover expenses and stations also rely on corporate sponsorships and viewer contributions. DirecTV and Dish Network are the major satellite television providers, with 20 and 14 million customers respectively as of February 2014. Meanwhile, the major cable television providers are Comcast with 22 million customers, Time Warner Cable with 11 million, and Cox Communications, Charter Communications, AT&T U-verse and Verizon FiOS with 5–6 million each. In the 20th century, the motion picture industry rose to become one of the most successful and powerful industries in the U.S. Along with other intellectual property industries, its relative importance to the American economy has strengthened as the importance of manufacturing and agriculture have decreased (due to globalization). Robert Rodriguez launched his own cable television channel, El Rey. The 1980s and 1990s saw another significant development. The full acceptance of home video by studios opened a vast new business to exploit. Films such as Showgirls, The Secret of NIMH, and The Shawshank Redemption, which may have performed poorly in their theatrical run, were now able to find success in the video market. It also saw the first generation of filmmakers with access to videotapes emerge. Directors such as Quentin Tarantino and Paul Thomas Anderson had been able to view thousands of films and produced films with vast numbers of references and connections to previous works. Tarantino has had a number of collaborations with director Robert Rodriguez. Rodriguez directed the 1992 action film El Mariachi, which was a commercial success after grossing $2 million against a budget of $7,000. In 2011, El Mariachi was inducted into the Library of Congress to be preserved as part of its National Film Registry for being "culturally, historically, or aesthetically significant". The film is further immortalized by Guinness World Records as the lowest-budgeted film ever to gross $1 million at the box office. The Internet has provided a means for newspapers and other media organizations to deliver news and keep archives public. Revenue is generated through advertising or subscription payments. The days of having to tune in live or buy expensive discs in order to watch your favorite shows and movies are gone. Online streaming makes it possible to watch everything from live news and sports to classic movies to modern TV favorites on their own time, and on any device they choose. Some of online streaming service providers are Netflix, Hulu Plus, Amazon Video and YouTube. Over-the-top subscription services that mirrored cable and TV Everywhere services began emerging in the mid-2010s. In 2015, Dish Network and Sony respectively launched Sling TV and PlayStation Vue, cable-style online and mobile streaming services priced at lower monthly rates than packages offered by traditional pay television system operators. ^ These 6 Corporations Control 90% Of The Media In America. Business Insider. 14 June 2012. "Twenty years ago, thirty corporations controlled 90 percent of the media. Today, it is a grand total of six mega-corporations - Rupert Murdoch's News Corporation, Disney, Viacom, Time Warner, CBS and Comcast. Besides accumulating their own profits, the media are daily trumpets for the rest of the corporate world's advertising." ^ "World Press Freedom Index 2014". Reporters Without Borders. Archived from the original on February 14, 2014. Retrieved February 14, 2014. ^ Stearns, Josh (11 February 2014). U.S. Plummets in Global Press Freedom Rankings. The Huffington Post. Retrieved 14 February 2014. ^ Stynes, Tess (October 28, 2014). "USA Today Remains Top Newspaper by Circulation". The Wall Street Journal. Retrieved June 28, 2016. ^ "High wires". The Economist. ISSN 0013-0613. Retrieved April 10, 2016. Margaret A. Blanchard, ed. (2013) . History of the Mass Media in the United States: An Encyclopedia. Routledge. ISBN 978-1-135-91749-4. Cynthia L. Clark, ed. (2011). "Media". The American Economy: A Historical Encyclopedia. ABC-CLIO. pp. 282+. ISBN 978-1-59884-461-0. Anthony Fellow (2011). American Media History (3rd ed.). Cengage Learning, Inc. ISBN 1-111-34812-X. Lisa Nakamura (2014). "Media". In Bruce Burgett and Glenn Hendler (ed.). Keywords for American Cultural Studies (2nd ed.). New York University Press. pp. 165+.